Whether it's in a small country parish or a cathedral a church wedding isn't a church wedding without flowers to brighten up the interior. However, decorating every pew end, choir stall and hassock hanger is likely to prove expensive - and, in many cases, unnecessary. Avoid big bills and over-fussy displays with this savvy guide to decorating the church. Floral decoration's a big part of church life, with displays being changed regularly for weekend services and religious festivals. 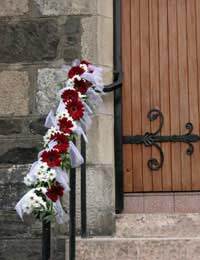 For this reason, churches often have a designated florist or a rota of helpers who organise all decorating within the venue. Talk to the vicar to find out who usually arranges the church flowers. Be prepared to negotiate if you want to bring in an outside florist. It's also worth asking whether any other couples are getting married in the church on the same day as you. They may be prepared to split the cost of the floral arrangements, which means you can pool your resources and go for a more luxurious display. Bear in mind that if you've got your heart set on doing the flowers your way and paying for them yourself, it'll be very difficult to move them in and out of the church if any other weddings are taking place that day. Some churches ban the use of flowers in church at specific times, such as Advent or Lent in the Christian calendar. If your wedding falls during one of these periods, consult the vicar about what decorations will be permitted. By contrast, other festivals (Christmas and Easter) use flowers to match their mood of celebration, so if you get married around this time there may already be an abundance of arrangements in place. If the choice of blooms is left up to you, you'll need to balance the size of the arrangements needed with your budget. Go for large, relatively inexpensive flowers such as daisies or carnations, combined with plenty of greenery. More expensive flowers like roses and lilies can be interspersed with the cheaper blossoms to keep costs down. It's best to keep your colour palette relatively traditional, both as a mark of respect to your surroundings and to avoid conflict with any other couples sharing the costs. Agree to use flowers in white and shades of one other colour so things don't become too complicated. The front of the church is where everyone's eyes will be focused during the ceremony, so make sure the boldest and most elaborate arrangements are placed here. There should be pedestal arrangements flanking the area where you'll say your vows, as well as flowers on the pulpit or stand for readings. Flowers are usually placed on the altar as a matter of course, but if there are any other tables or flat surfaces in the front of the church, ensure table arrangements are added to these as well. Small bunches of flowers are a traditional decoration for pew ends, and look wonderful lining the aisle as the bride walks towards the altar. If you're marrying in a modern church, consider decorating the backs of chairs with posies instead. This carries the benefit or everyone being able to see the flowers, but is more expensive than simply decorating the ends that meet the aisle. They're expensive to create, but a couple of free-standing pedestal arrangements will prove remarkably versatile. They can be placed flanking the altar to form a backdrop for singers and musicians, used outside the entrance during the photographs, and even taken on to the reception venue to be enjoyed later. Don't put flowers in any area of the church that people won't be able to see when they're sat down. If you're on a budget, sit at the back of the church, imagine your line of vision filled with people, and then work out which parts will still be visible to the observer. This exercise should help you work out where to put arrangements for best effect. Finally, make sure you've got confetti for showering the happy couple with blessings as they leave the church. Fresh or dried flower petals, aromatic herbs or whole dried flower heads are colourful, fragrant and environmentally friendly - so any birds pecking around after the ceremony can enjoy the flowers as much as you!